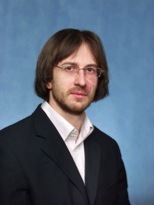 Alexey Bobrovsky received his PhD in Chemistry in 1999 from the Moscow State University. Starting from this time up to now he is a scientific researcher at Chemistry Department of Moscow State University. During last ten years he received a number of awards: Award for young scientists from the European Academy of Sciences; Grand Prize in Chemistry from the Russian Academy of Sciences and Pleiades Publishing, Inc. (“MAIK-NAUKA”) for the best publication in 1998 year; Alexander von Humboldt research fellowship at Philipps Universität Marburg, Prof. J. Wendorff laboratory, etc. He is a member of the Editorial Board of International Journal “Liquid Crystals” (starting from 2006). In 2010 he has received President Prize for Young Scientists and Doctor of Science degree. His research focuses on the multifunctional liquid crystalline comb-shaped (side-chain) polymers and dendrimers including polymer synthesis, structure-property relationship elucidation, study of polymer LC blends and composites, photo-, thermo- and electro-optical phenomena in LC polymer systems. Platelet texture of Blue Phase in high-molar-mass side chain polymer was observed for the first time in our laboratory (Moscow State University) in 1996. Results of these investigations were published in Liq. Cryst. V. 24, No. 4, 1998, pp. 489-500. 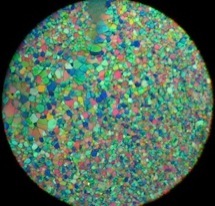 The unique difference between Blue Phases in low-molar-mass and polymeric systems is their great stability in the case of polymer. The sample presented in photo was obtained by overcooling to room temperature. Recently I have found this sample and was completely surprised because texture remains the same after ca. 14 years of storage at room temperature! Image diameter is about 400 micrometers. Jury comment: Having just returned from the 23rd International Liquid Crystal Conference hosted in Krakow in wonderful style by colleagues in Poland, I was struck by just how many papers concerned the blue phases. The subject originally enjoyed a lot of attention in the 1980s and 1990s. I've selected this beautiful picture of a polymeric blue phase because, in addition to demonstrating the beauty of these systems, the fact that the sample was prepared nearly 15 years ago and has endured the intervening years reflects the 'rebirth' in the interest of the science of blue phases.